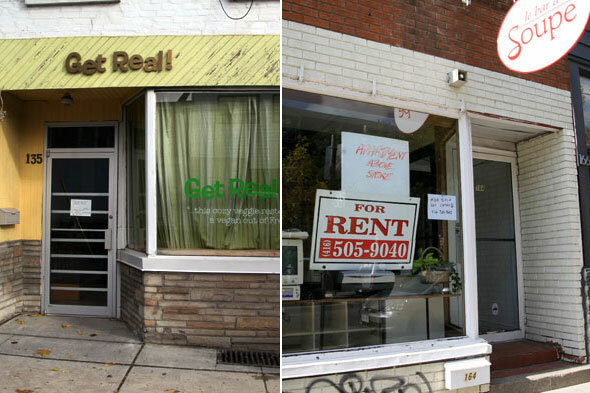 2009 has been a rough year for Toronto entrepreneurs. Rents have been rising, consumers have been spending less and competition from the net and big box stores has intensified, a nasty combination of factors that have littered our deadpool with restaurants, stores and countless other failed businesses. As we wind down the year, more closings are on the horizon. The Queen of Tarts baked their last cookie on the 24th and the Toronto Women's Bookstore and CiRCA are both in trouble. The Big Bop has also announced its last live show will come in January. The biggest disappointment of the year has to be Pages. While indie bookstores are definitely a dying breed, it was still a shock to see its empty shelves as it opened its doors for the final time at the end of August. After three decades in business Pages couldn't negotiate a workable lease from its landlord at the corner of Queen and John and efforts to find a new location proved futile. But the real kicker? After fours months the old store still sits vacant with no new tenant yet willing to take on the higher rent for which Pinedale Properties has been seeking. 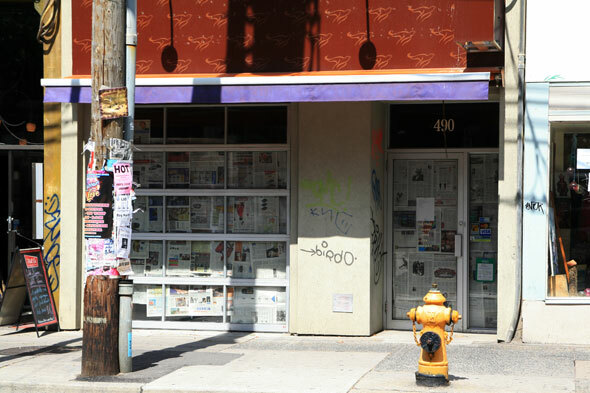 2009 was time to say goodbye to two Ossington originals. No, not Golden Turtle or Alex Rei Dos Leitos, but two unique neighbourhood faves that served their first lunch before Libretto, Jezebel, the Painted Lady et al. arrived on the scene. Le Bar a Soupe may not have had the best business model but few would find fault in the quality of owner Natalie Barin's homemade soups. And it seemed like a surprise to everyone when Get Real suddenly wasn't open for brunch one weekend. As of today, both places are still sitting vacant and likely will remain so until the Ossington moratorium runs its course. 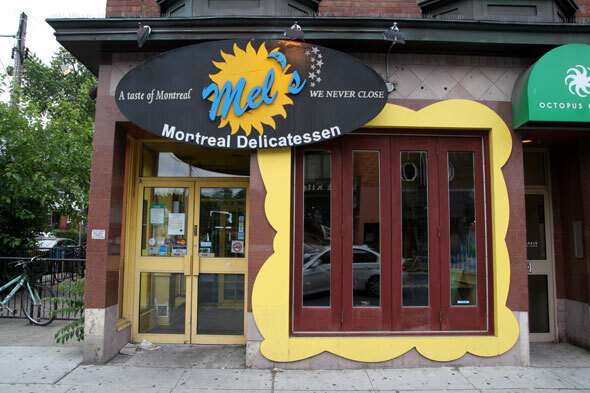 Mel's Montreal Delicatessen wasn't the best deli in Toronto but there's no denying it had a certain appeal, particularly at three in the morning for a greasy, drunken late night breakfast. Now the space is being turned into cocktail lounge Hey Lucy! causing some to wonder whether recent changes in the Annex are too much for locals to stomach. Speaking of changes, Rosedale might be more or less the same than it ever was, but the closing of Lakes still was a sign that recent developments to the stretch between Crescent Road and Roxbourough had passes some businesses by. The opening of Le Petit Castor stole some of Lakes' loyal clientele and when Lakes' costly renovations and change in chef failed to deliver a much needed lift it wasn't long before the end came. Now rumour has it the owner of nearby Capocaccia has acquired the lease and will be opening a new Italian tapas and charcuterie place called Tapo. It's been quite a year for bad boy chef Marc Thuet with his successful reinvention of Bite Me into Conviction. 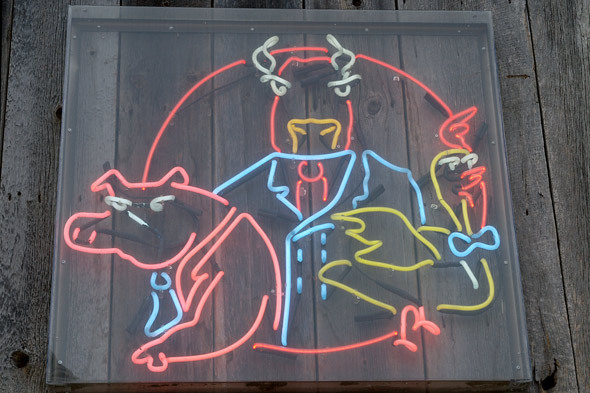 But his involvement with the original Cluck, Grunt and Low location in the Annex and then its short lived spawn on Bayview resulted in two quick closures that surprised both loyal customers and the staff, one of whom remarked to us that it closed because ""the owners just decided that they didn't want to do it anymore." In its place: 50 wings and 50 salads courtesy of the student-friendly Puck N Wings. When Dooney's closed in February it didn't really surprise anyone. But as a local landmark it was still yet another sign of old businesses turning over to new in the Annex. Some say it was a victim of Restaurant Makeover while others point out that its service and food weren't without their shortcomings. Its owner - Graziano Marchese - went on to open the Annex Live while T Cafe claimed its prime corner location. 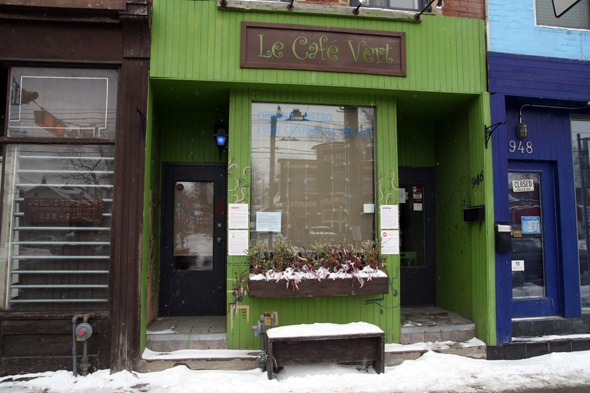 Leslieville has been nothing but booming, and factor in that it's something of a brunch destination it was a bit of a shocker to see Le Cafe Vert shutter in January. A sign on the door hinted that closure was only temporary but soon it became clear that the vegan and celiac friendly eatery was done for good. Later in the year doggie destination The Bonehouse took over the lease while Swirl Wine Bar moved in upstairs. 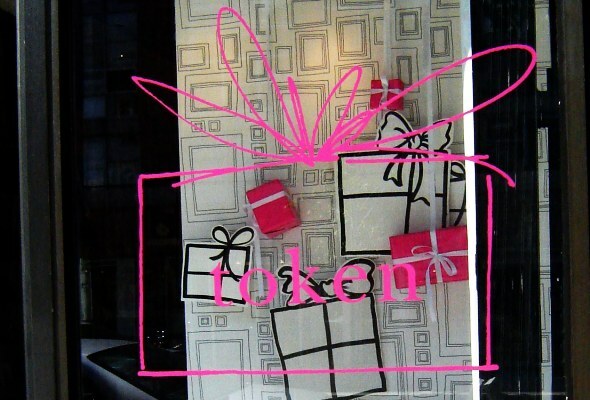 Design, gift, card and paper store Token claimed our first deadpool of 2009. 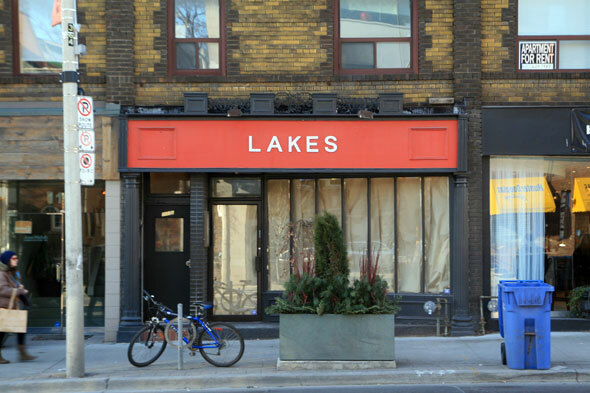 Its lease was up at the end of last year and with rents going sky high on West Queen West its owner decided not to renew and focus on other pursuits. There was talk that the store would relaunch somewhere else later in the Spring but so far that initiative hasn't materialized. Further east on Queen between Spadina and Bathurst, the short-lived Greenavi Cafe served up a delectable "caravanilla" latte and free WiFi, but its owners decided to "move on to another chapter in [their] lives" at the end of the summer. The good news is that the Venezuelan inspired Arepa Cafe has surfaced in its wake and looks to have the goods to make a success of it in this high rent part of town.